Spring has sprung and summer is on its way. With all the flowers in bloom, butterflies are flitting around everywhere. 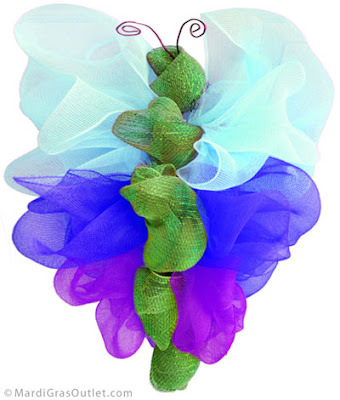 We were inspired to create our your own butterfly out of Deco Mesh! 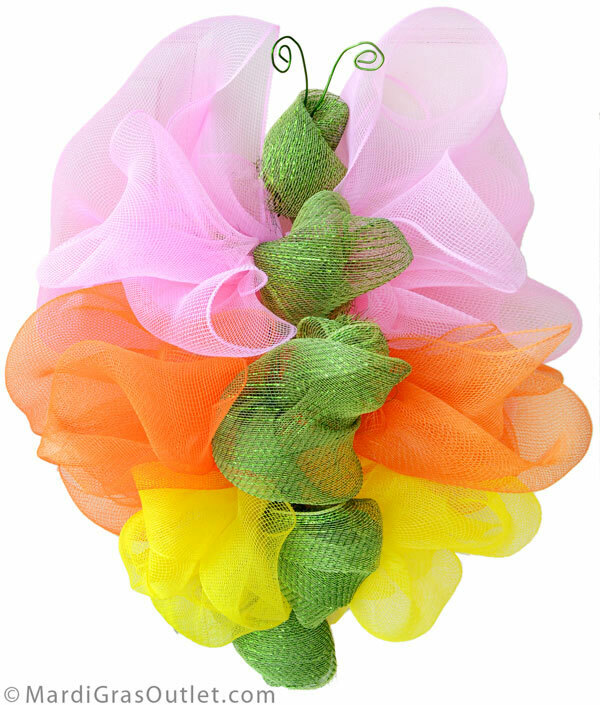 This fun butterfly can be used as a wreath or hanging decoration for an outdoor party. Isn't she lovely? Keep reading to see how to make one of your own. The cost of the supplies for a 1 color butterfly is under $17, a two color butterfly costs under $23, and a three color butterfly is under $29. There will be more than half of the roll of aluminum craft wire left over for additional projects. We used between 8 and 10 feet for each color of deco mesh in order to make the wings, so the Butterfly Deco Mesh project is perfect for using up long scraps of mesh from old rolls. 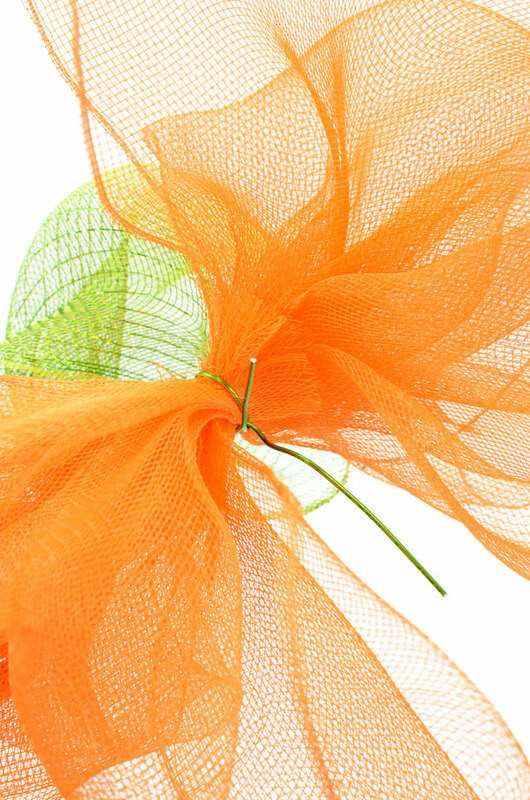 You can use any colors of mesh that you prefer, a wide range of colors and patterns are available here. We used apple green colored aluminum wire in order to match the body of the butterfly, but any color could be used, (other colors available here). The entire butterfly with 3 wing colors took less than an hour to create. 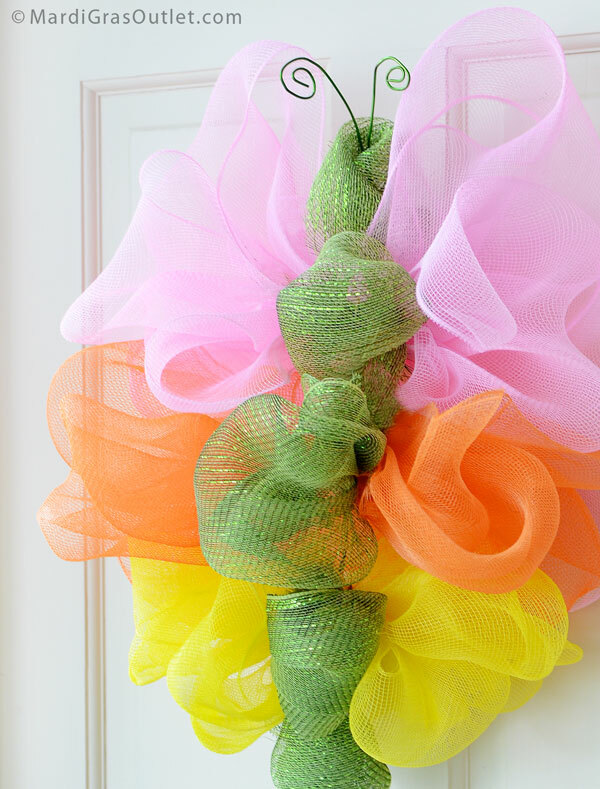 Follow the steps below to create your own Deco Mesh Butterfly Wreath! Cut about 5 feet of Aluminum Craft Wire. 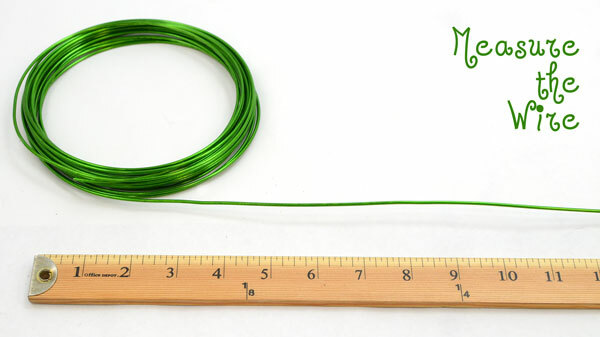 One end of the wire should be about a foot longer the other, so make a bend in the wire that creates one side about 2 feet long, and the other side about 3 feet long. 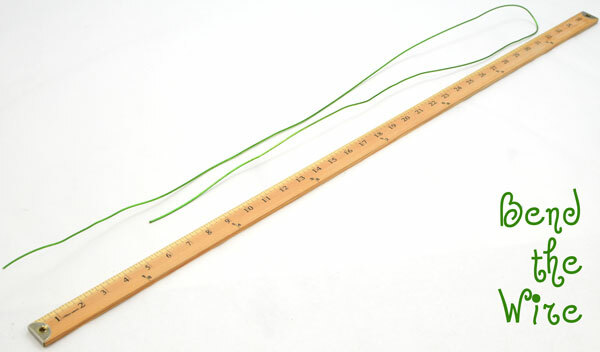 Grasp the side of aluminum wire that is 3 feet long and form a loop as if you were tying a knot around both sides. Then twist the loop to secure, (the loop should be about the size of a 50 cent piece). The loop will hold the butterfly's head in place, as well as give a hanging hook. Curl the two top wires into spirals to look like antennae. The head and body of the butterfly are made of horizontal small loops of deco mesh.Cut an 8" length of mesh for the butterflies head. We chose an apple green metallic deco mesh. Beginning above the loop you formed, Lay the mesh loop underneath the wire body structure you made in the last step. Wrap the mesh over the top of the wire, then crisscross the mesh underneath the body. Tie a knot in the mesh. Trim the excess mesh as shown. The body portion of the butterfly combines a green loop and a larger bow for the wings. Cut an 8" length of green mesh for the body. 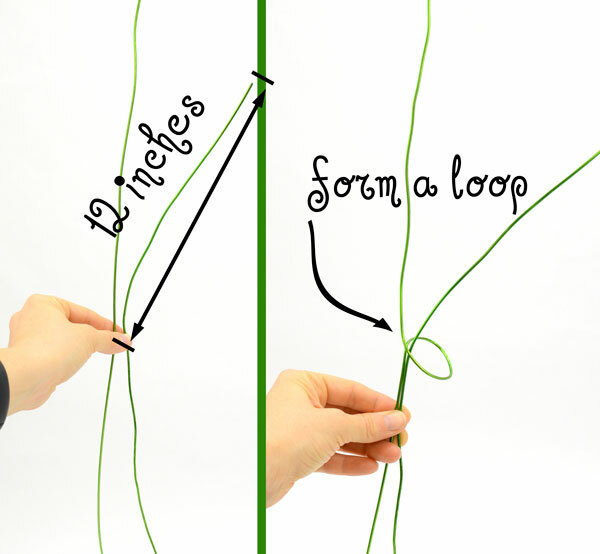 Form a small loop and secure it with an piece of wire about 8" long. 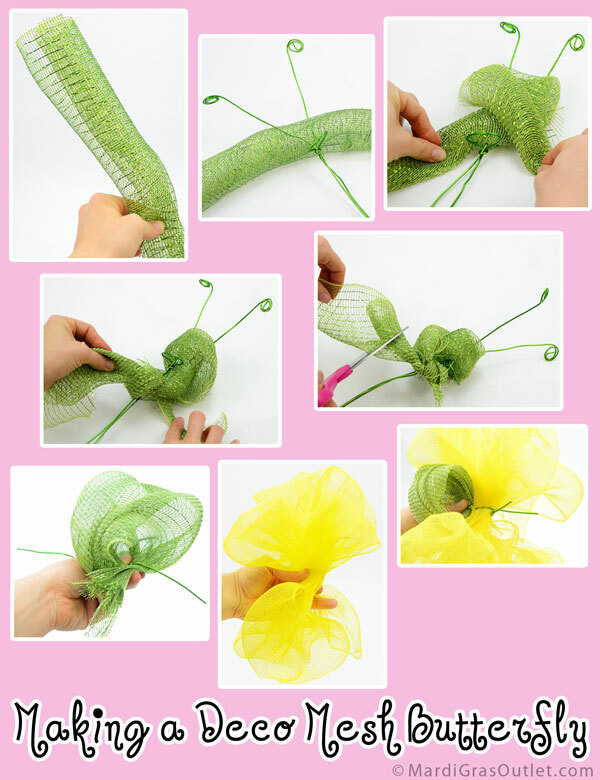 Make a bow with mesh (directions are shown below in detail). The bow becomes with wings of the deco mesh butterfly. 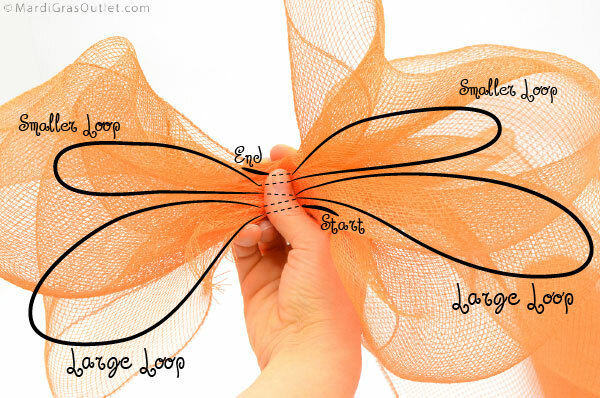 Attach the green mesh loop (section of the butterfly body) to the mesh bow (the butterfly wings) and you now have 1 section of the body of the butterfly. Repeat these steps two more times to make three butterfly sections. You can choose to make the butterfly wings different colors or make them all same. 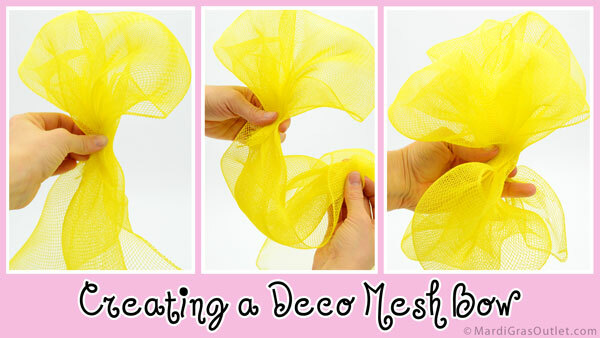 Below are detailed steps on how to make a bow/wing loops using 21" wide deco mesh. First, form a loop using about 12-18" of Deco Mesh. Without trimming off of the roll, pull another 12-18" of mesh, and using your other hand, grasp the mesh in the center. You should now have 2 large loops of mesh. Repeat this process using less mesh to form smaller loops, using about 8-14" of mesh. Do not trim the mesh from the roll until you have 2 large loops, topped with 2 smaller loops. The diagram below show you what the bow should look like when finished. Step 6- Attach the wings to the body. Lay the wire body piece over the wings you created. The head and the wings should both be right side down. Grasp the wires from the wings and twist them around the body. Repeat for all 3 sections of the butterfly. Step 7-Create the bottom tail end of the butterfly. Cut a 9" to 12" length of mesh the same color as the body. Tie a knot over the wire body below the bottom wing segment. Once you have tied the knot, there will be extra wire body left at the bottom. 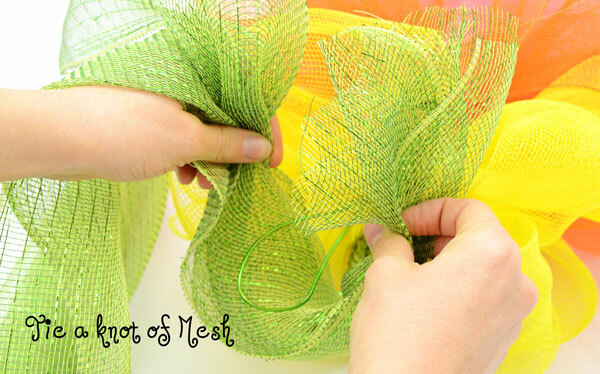 Use the loop of aluminum wire to secure the last body segment by pulling it up and over the knot of green mesh. Then twist the loop around the wire to secure. Now that your parts all the parts of the butterfly are assembled, you will need to fluff the wings, arrange the body sections, and adjust the curls on the butterfly's antenna. The finished Deco Mesh Butterfly! 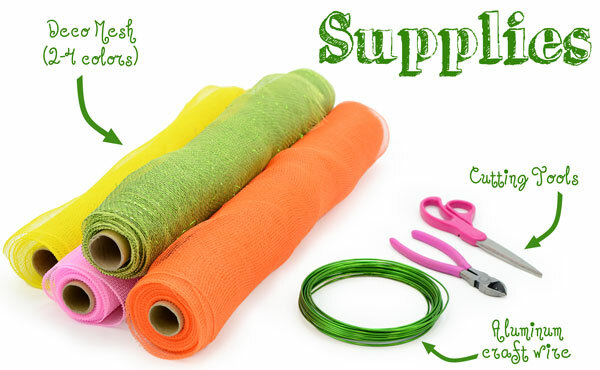 You can also make them in a variety of colors and shapes! By making the bows larger or smaller you can change the shape of the butterfly. 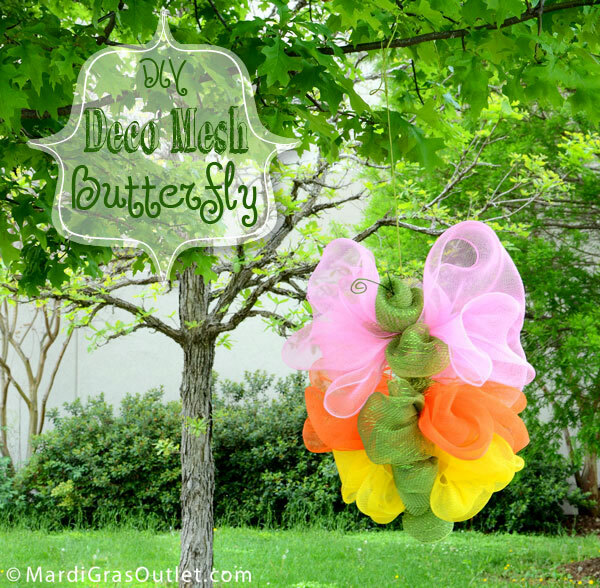 These deco mesh butterflies are precious decorations for an outdoor event. Make a few and let them fluttery in the trees. Great idea! Super cute! 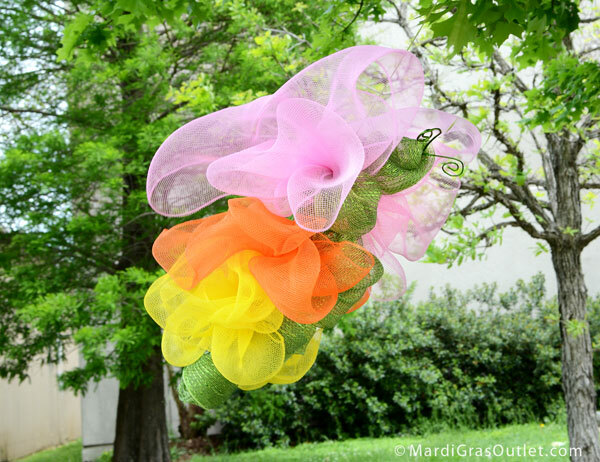 Thanks so much for sharing how to make this butterfly...a lot of bang for the buck!